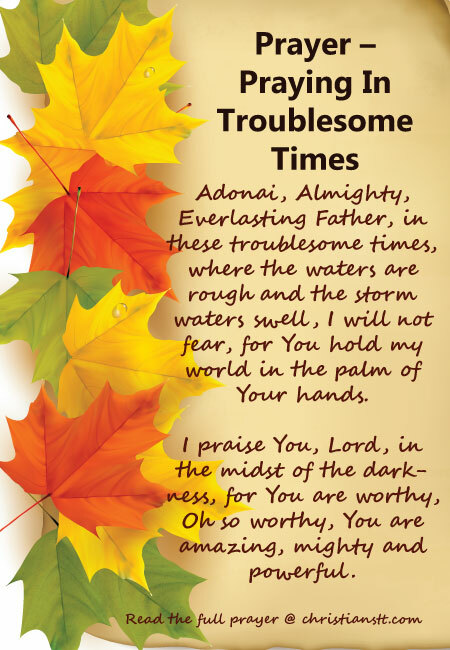 Adonai, Almighty, Everlasting Father, in these troublesome times, where the waters are rough and the storm waters swell, I will not fear, for You hold my world in the palm of Your hands. I praise You, Lord, in the midst of the darkness, for You are worthy, Oh so worthy. You are amazing, mighty and powerful. I trust Your Holy presence to guide and correct me in all that I do. Whatever trouble comes my way, I would be fully equipped with Your armor to emerge from the battle, victorious. You are in control and, whatever the outcome, I know You designed it to work together for my good. Father, please bring me out of this situation, I need You Lord, right now. When trouble arises, Oh God, draw near and quiet my soul. Allow me to react with peace and love toward my fellowmen. Guide my thoughts, my actions and my words to reflect You. Bring forth tranquility, when anger and rage rushes in. I humbly ask that You rid me of anything that breaks Your heart, along with the troubles that may follow. In Jesus’ mighty name I pray, Amen!